How do you get the ‘WOW’ factor across in your next solid surface project? Backlighting. Solid surface designs can be extraordinary and lighting them up can make them stand out from the rest. Backlighting acts like the cherry on top to the solid surface sundae and is a perfect finishing touch. The right type of lighting will elicit attention, illuminate details, and add dimension to the project. Composition and depth of the solid surface can get lost in dark locations. Some of the leading solid surfaces on the market today have an element of translucency. The last thing anyone would want would be for that trait of translucency to go unnoticed. Don’t let your solid surface project evanish into the background. Make it the focal point by lighting it up. 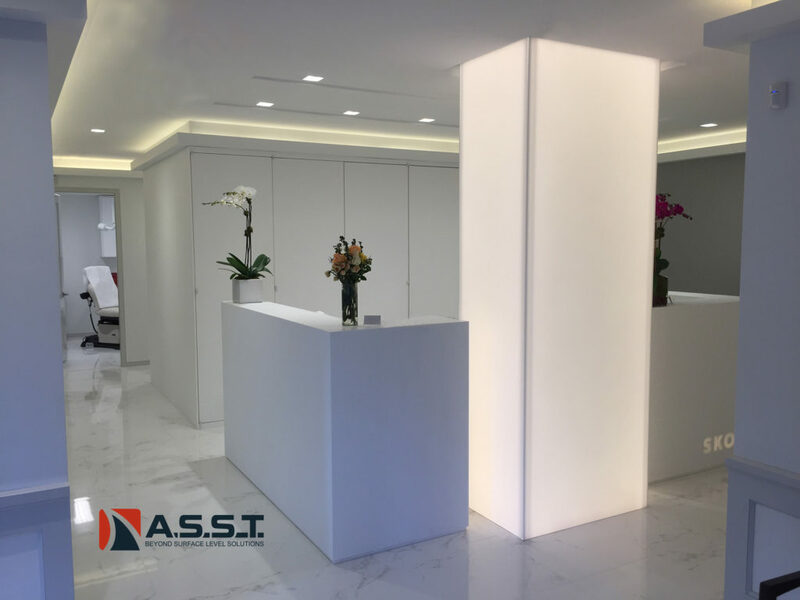 At ASST we fabricate the most breathtaking and eye catching designs of Corian®, 3Form®, Krion®, LG HiMacs®, Avonite®, Wilsonart®, as well as other solid surface materials. Our creations come in different textures, colors, transparencies, and backlighting will make them stand out even more. Lighting fixtures can range from LED panels to light tape. Either way, lighting behind an ASST solid surface will make your project radiate in its space. ASST can design and incorporate backlighting into the solid surface project plan to make sure that it is unique and enhances the solid surface. Let ASST guide you through the dark on your next solid surface backlighting project. This entry was posted in Solid Surface Fabrication & Manufacturing and tagged backlighting, led, solid surface.